Art Connoisseur or not, we have the perfect itinerary for you. The visual art community in Eau Claire has been growing for quite some time. It&apos;s become a vital part of what makes this town such a unique place. With all of the shops, galleries and exhibits there is something for all tastes. Located in Downtown Eau Claire, The Lismore only steps away from many attractions. The Lismore offers fantastic amenities, fine dining at The Informalist and coffee and pastries at Eau Claire Downtown Coffee, as well as sleek, modern decor that design fans will love. 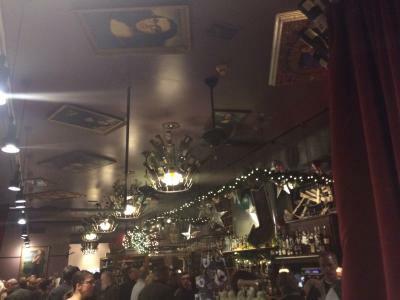 At Mona Lisa&apos;s on Water Street, the art is not only on the walls, but it&apos;s also on the plates. Take in all the artwork featuring variations on the restaurant&apos;s namesake while enjoying a glass of wine and some of the most creative food in town. Mona Lisa&apos;s menu changes weekly and always includes seasonal ingredients. On a recent visit I had the most delicious stuffed dates followed by a spectacular pizza. Eau Claire Insider Tip: Keep an eye out around Water Street and Downtown for the Mona Lisa image on several buildings. 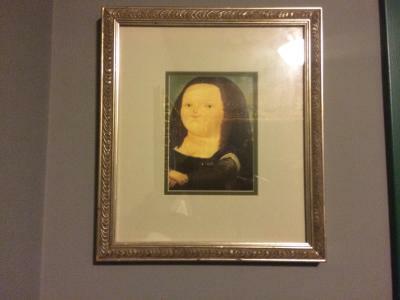 They were part of the original marketing when Mona Lisa&apos;s opened about twenty-five years ago. Eau Claire is home to fantastic art galleries, and many of those galleries also house artists&apos; studios. One of the newest is Artisan Forge Studios. 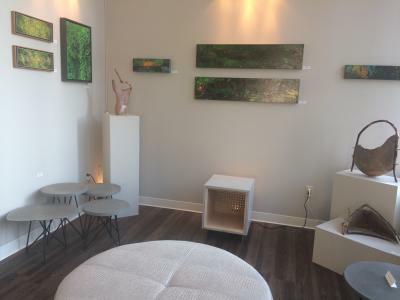 Home to more than 20 artists and artisans, Artisan Forge combines gallery and retail space while offering collaborators a place to create their art. Some of the artists and businesses include Blue Canvas Art Studio, Token Jewelry, Tightly Bound Books, and The Eau Claire Design Company. Visit Artisan Forge&apos;s website to learn more about the artists and their work, special events, and workshops where you can learn and create art yourself. Another beautiful gallery and retail space, 200 Main, recently opened up in Downtown Eau Claire. They feature a rotation of guest artists, many from the Chippewa Valley, in their main gallery, with artwork, furnishings, and jewelry for sale in their Gallery Market. The largest art gallery in the Chippewa Valley is found right on the UWEC campus. The Ruth Foster Art Gallery is open to the public throughout the academic year and offers not only student and faculty artwork, but also shows featuring artists from all over the world. Located just steps away from each other in Downtown Eau Claire, sister stores Tangled Up in Hue and Blue Boxer Arts are must-visits for anyone appreciative of art and for anyone looking for a gift you&apos;re unlikely to find anywhere else. 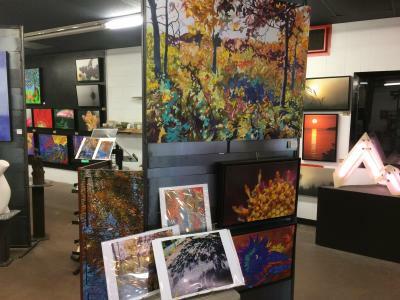 Tangled Up in Hue supports over 100 artists from the Chippewa Valley, selling wall art, pottery, stationery, jewelry, clothing, decor and more. Newcomer Blue Boxer Arts is the place to go for quality materials and inspiration to create and complete your projects. 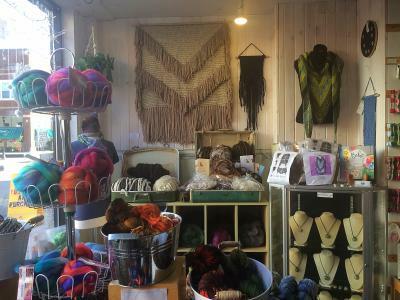 Beautiful yarn and beads are the featured materials for sale, and Blue Boxer Arts also offers classes and workshops. Chalkfest, The Sculpture Tour, and The Banbury Art Crawl are yearly events worth planning your visit around. 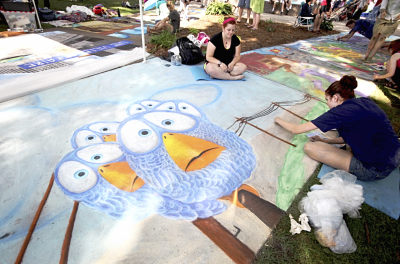 Sponsored by Volume One and held on the UWEC campus, each summer Chalkfest gives artists of all ages and skill level a chance to have fun by creating beautiful chalk drawings, and attendees have the opportunity to vote for their favorite works in various categories. Since 2011, the Eau Claire Sculpture Tour has been a favorite of locals and visitors alike. Each May a new set of sculptures arrives and is displayed throughout downtown and on Water Street. A North American artist creates every locally-sponsored piece. Every year, voters cast thousands of votes for the public&apos;s favorite creation, and the winning sculpture becomes a permanent piece in the city. Every February thousands of art lovers descend upon Banbury Place near Downtown Eau Claire for the annual Banbury Art Crawl. This two-day event features art demos, live music, food, and most importantly, local artists and artisans sharing their studios and their talents, with woodwork, photographs, ceramics, jewelry, and more for sale. The 2018 Banbury Art Crawl is February 9-10. What are your favorite art destinations in Eau Claire? Share them with us in the comments and be sure to tag your art photos #CaptureEC!